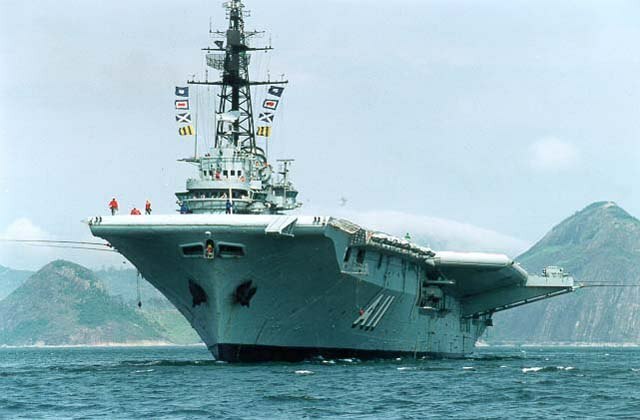 The Aircraft Carrier 'Minas Gerais' was purchased from the Royal Navy on the 13th December 1956, formerly H.M.S. 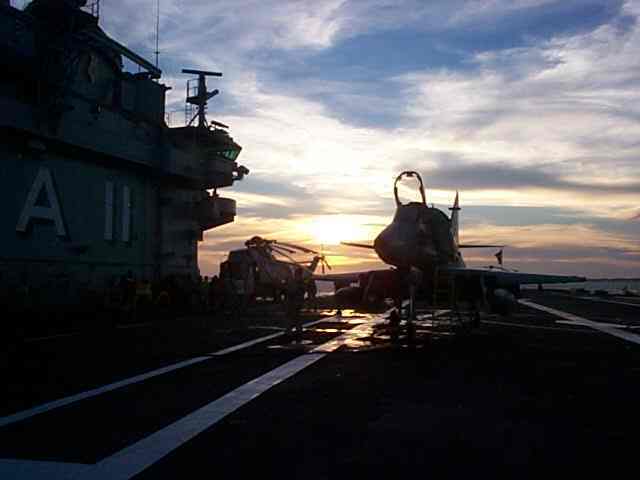 Vengeance, she was sold at a cost of $9 million, to the Brazilian Navy. She was taken to Holland, where in the summer of 1957, reconstruction work commenced at Verolme Dock, Rotterdam. The lengthy reconstruction, conversion and overhaul included a new island and radar equipment, mirror sight deck landing system, steam catapult, armament fire control and an 8.5 degrees angled deck. The two engineering units, each have a set of turbines, with two boilers installed side by side. The steam capacity was increased, when the boilers were re-tubed during the reconstruction of the ship. An alternating current (a.c.) electrical system was also installed, giving a total of 2500kW., supplied by four turbo-generators and one diesel generator. 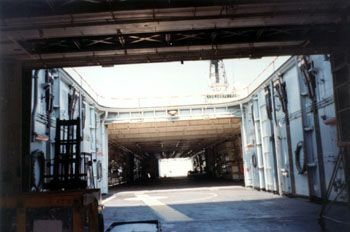 The single track catapult accelerator gear for launching, was located at the port side forward. 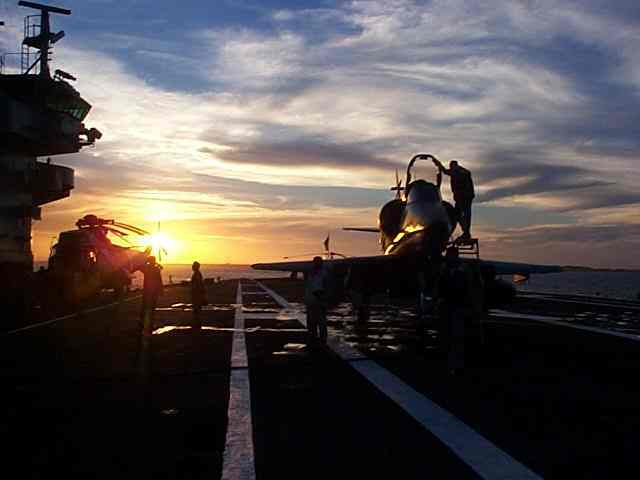 A sophisticated radar system, was also installed and consisted of air surveillance, surface search, fighter direction, air control, firing control and navigation facilities. The work was completed in 1960, at a cost of $27 million. On the 6th December 1960, 'Minas Gerais' was Commissioned into the Brazilian Navy. 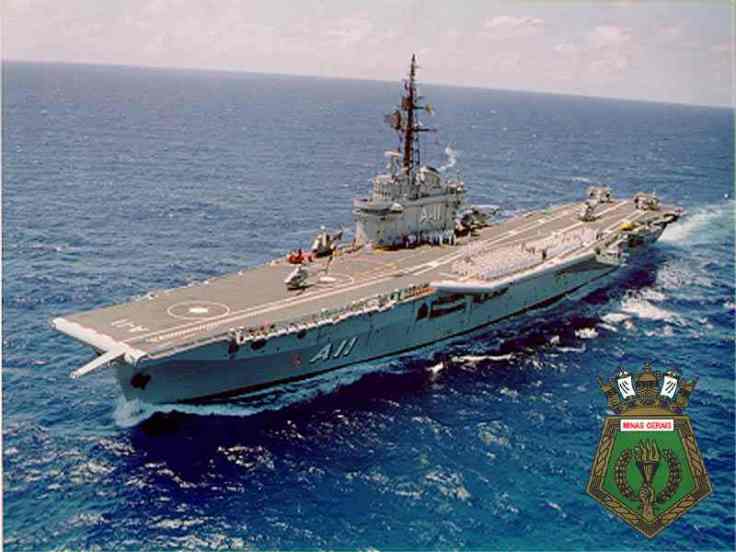 She sailed from Rotterdam on the 13th January 1961, for Rio de Janeiro, Brazil and was primarily used for Anti-Submarine aircraft and Helicopters, which are operated by the Brazilian Air Force. 'Minas Gerais' was overhauled during the period of 1976 to 1980, completing a five year re-fit in 1981, which gave her an expected life into the 1990's. Details. 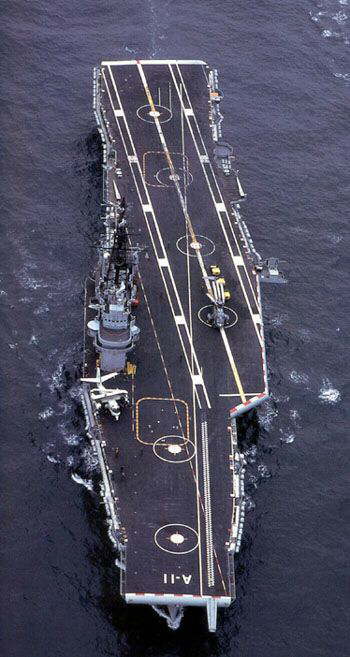 She was still in service until October 2001, despite speculation that she was to be scrapped, although she was down classed to a Helicopter Support Ship, due to the Brazilian Navy's recent purchase, of the French Aircraft Carrier "Foch". 'Minas Gerais', Pennant No. 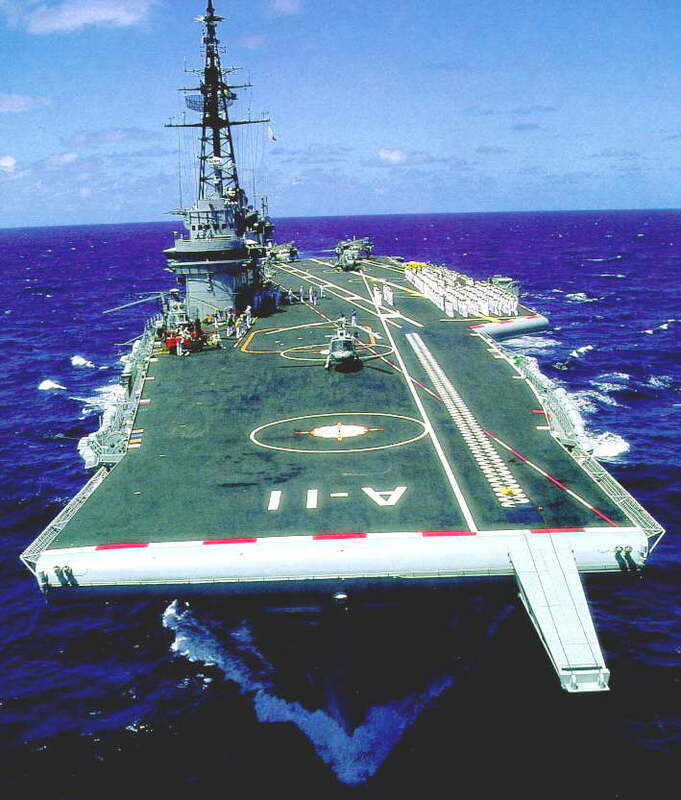 'A 11' was the Brazilian Navy's only Aircraft Carrier, prior to the purchase of "Foch" (now renamed 'Sao Paulo') and the last of the Royal Navy's Wartime Aircraft Carriers, still surviving, 58 years after she was built. On Tuesday 16th October 2001, 'Minas Gerais' was de-commissioned by the Brazilian Navy and is currently at the Naval Dockyard at Rio de Janeiro. Her generators are being used to supply the Dockyard, due to a power shortage. Moves are afoot by the 'Battle of the Atlantic Memorial Ships' (BAMS) to purchase the "Minas Gerais" from the Brazilian Government and preserve her as a 'floating museum' at the Aeronautica Heritage Centre in Southampton, Hants. Negotiations are still on-going, although the Mayor of Rio de Janeiro, has the same idea of preserving the ship for the City. It is hoped, that the BAMS offer is accepted and that ex-HMS. Vengeance (Minas Gerais) will be returned to the U.K. The estimated time of arrival in the U.K., providing all goes to plan, is Spring 2002. All plans and negotiations failed and the ship was towed from Rio de Janeiro in February 2004 to India, where she will be broken up. 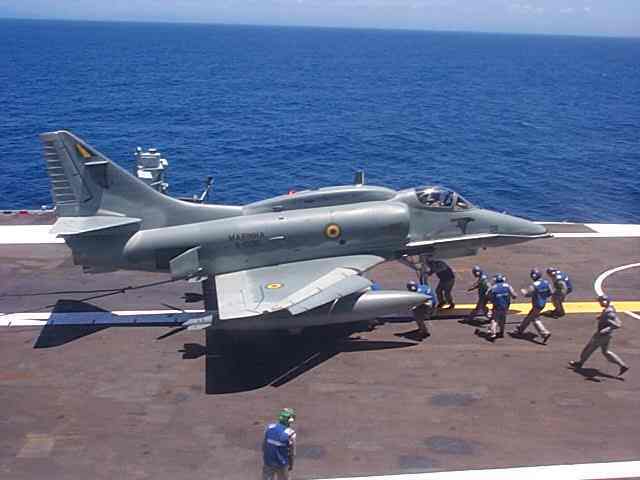 Sequence of Photographs showing the take off and landing of a Skyhawk A-4 January 2000. 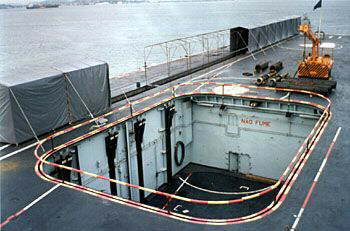 View of forward lift and repairs to catapult. Aerial view of Minas Gerais. Sixteen of the twenty seven Commanding Officers of Nael Minas Gerais. Back Row (first left to right) is the last Commander of the ship, Captain Júlio César de Araújo Passos. 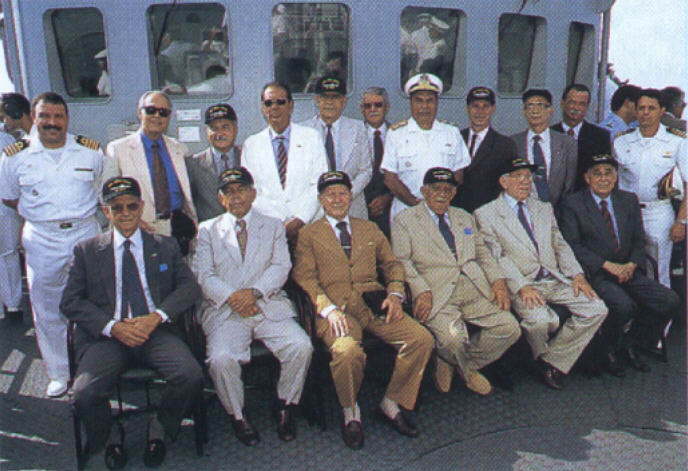 Front Row (fourth left to right) is the first Commander, Vice-Admiral (retired) Hélio Leôncio Martins. With thanks to LTC. Marco Antonio Schiavon (ex-Minas Gerais) for these photographs.